Hey, you — yeah, that's right, you. I'm Charged Up about the Apple Watch. Ready to hear why? Well, ever since Tim Cook stood on stage in September 2014 and unveiled the Cupertino company's dip into the world of smartwatches, and the auditorium gave oohs and aahs about sending your heartbeat to someone and composing texts from the wrist, the Apple Watch has pretty much led the space. And rightly so, in many respects. The biggest company in the world did what it's always done; it took all the aspects that made rival smartwatches good and formed a package that was great. And not just that. It's now managed to keep on improving, carving out a distinct look which ranks among the best in the industry and delivering a stacked app store to help you move things away from your iPhone, all while still being relatively easy to use if you're new to smartwatches. Crucial internal elements, such as GPS, have also helped it further its tentacles into the worlds of both fitness and wellness. But despite the vaunted Watch helping Apple become the best selling watchmaker in the world — that's right, reader, it even trumps Rolex — it's not perfect. We've talked extensively about what Apple needs to do next, and things it's neglected during its first three iterations. It's a wish list that includes opening the garden gate to Android users and pushing its health initiative even further. But one thing we didn't discuss was its current inability to truly, truly be a 24/7 device. This is no secret, obviously. The Apple Watch's battery has been stuck at around 1-2 days since launch, meaning it still has to sit on charge with your iPhone every night if you want to have it on your wrist the next day. For some, that's not a big deal. But it is for me. Instead of it sitting on charge, I want to keep it on. To be considered the most rounded smartwatch experience, it surely has to remain functional around the clock and begin tracking sleep. Of course, there are Apple Watch sleep tracker apps from third parties that already let you do this, but I don't want to have to sacrifice part of my daily tracking every damn day in order to build up a fuller picture of my activity. Even if the incessant charging didn't bother me, I'd still prefer to have this data gathered from Apple itself, because syncing back to Activity would be seamless and keep everything in one place. If only there was another company that had already conquered this issue. Oh, well you know who has, by some definition, created a more 'rounded experience' than Apple? One of its newest smartwatch rivals — Fitbit. Don't get this twisted, I'm not out here trying to make the case that the Fitbit Ionic is a better smartwatch. Its half-baked App Gallery, stripped back Coach platform and divisive aesthetics currently hold the device back from competing seriously for the gong of best smartwatch, but its battery life (bolstered, no doubt, by the acquisition of Pebble back in December 2016) and sleep tracking are two of its its biggest strengths. Personally, being torn between the pair has been spurred on by a New Year's resolution to get more sleep. And like with anything else, having a complete hub to keep track of your progress makes things easier. Add that to the fact that Fitbit's sleep tracking accuracy is the best from the wrist in the business, and it makes for a complete package. 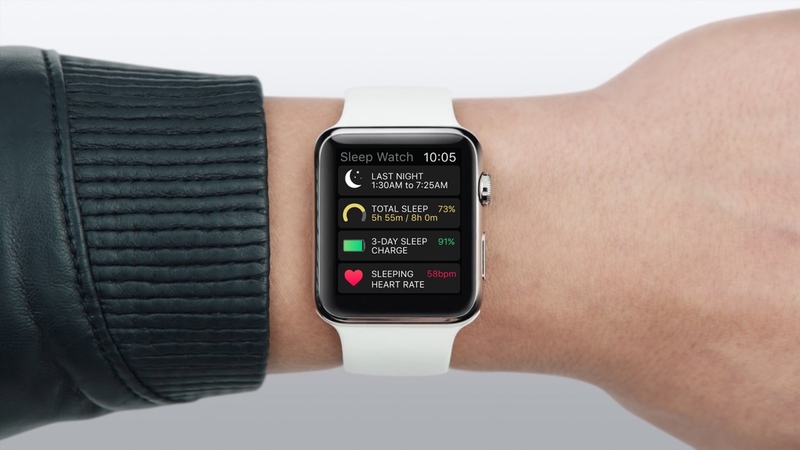 Why would I entertain the Apple Watch if Fitbit can match its daily activity tracking and best its sleep tracking? Now, having said all this, just how long Fitbit has this leg-up remains to be seen. Apple's acquisition of Beddit in May last year, I imagine, wasn't just for laughs, and after a small iterative upgrade through the Series 3, it would be a surprise if it didn't push the boat out and begin offering stronger battery life through the Apple Watch Series 4. And battery life, kids, is almost definitely why this hasn't happened yet. Having more battery life to play with is the key. If we get an improvement by the time the Series 4 rolls around, I could just get my wish of sleeping with my Apple Watch. If not, I may consider putting the watch to bed for good.